Italian Greyhounds are an ancient dog breed. 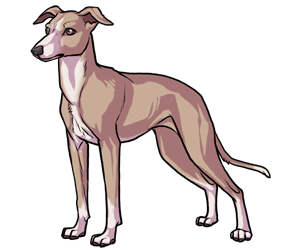 6,000 year old Egyptian tombs shows evidence of dogs similar to the Italian Greyhound. They are illustrated in Medditerranean art, that is 2,000 years old. During the Renaissance, the breed became popular with noblemen. The remains of a little, Greyhound-Type dog was found in the Roman city of Pompeii. The breed was brought into Europe by the Phoenicians in the 16th century, and became popular with European royalty. James I of England, Catherine the Great of Russia, Anne of Denmark, and Queen Victoria all owned Italian Greyhounds. The AKC recognized the Italian Greyhound in 1886. Adult dogs appear fragile, but the appearance is an illusion. Italian Greyhounds have two weight varieties; 8 pounds(4 kg.) max., and over 8 pounds(4kg).